This was supposed to be a trip to Budapest. Flights were booked, research was done and itinerary set with military precision. Then a certain budget airline changed our flights to leaving and arriving at stupid o’clock and scuppered all these best laid plans. At least we were allowed to re-book, so having checked availability we showed Son the list of destinations and gave him the choice – Pisa leapt out (all to do with a certain Tower I think) but that was that. Pisa was where we were headed. 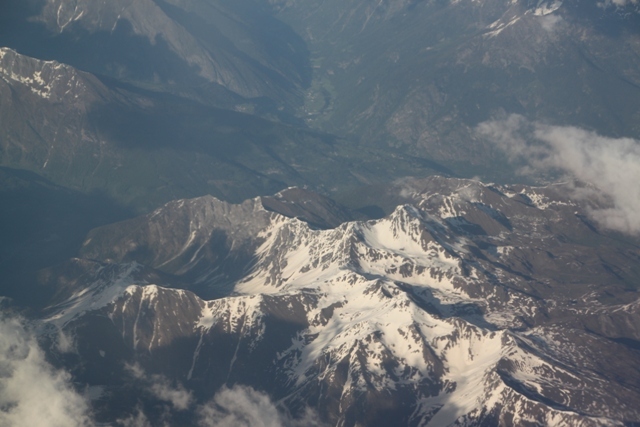 After all the hassle the flight was great and with views like this of the Alps en route, who could fail to be impressed? We had been to Pisa years ago (before Son) for one of those fleeting visits that was all about the Tower. This time I was determined to see if there was anything beyond the Square of Miracles. Plenty of people commented pre-trip how it was an ugly city, there was nothing else to do but climb the Tower and even some travel blogs I checked out were not entirely complimentary about Pisa. I am pleased to say we completely disagreed. We walked from the railway station to the Arno River and were enthralled. 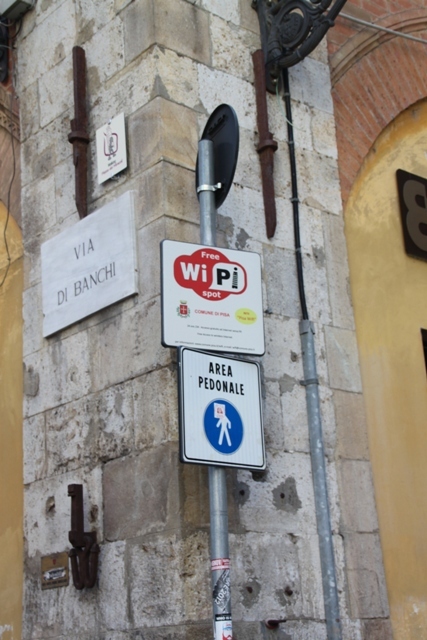 Son was enthralled with the WiFi signs – he thought the buildings were “nice” but the signs did it for him. 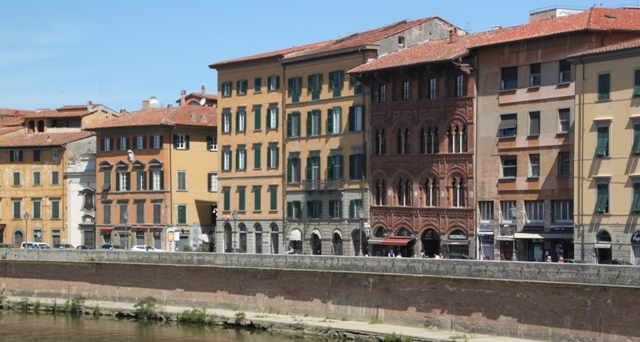 The buildings did it for us though – Pisa goes back to Etruscan and Roman times and there is no better way to soak up a feeling for the ancient city than by strolling through the narrow, winding streets. 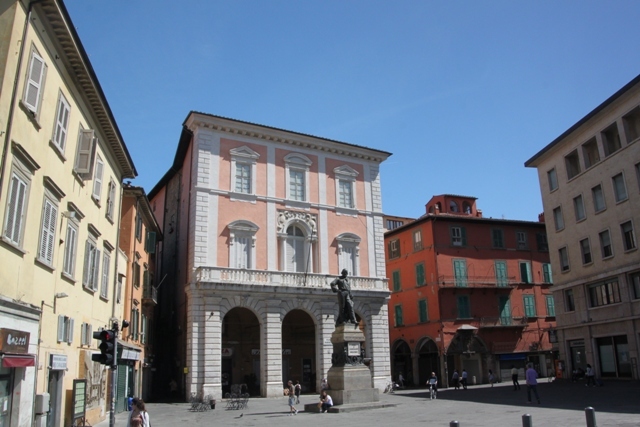 The buildings are gorgeous – Medieval and Renaissance beauties with piazzas galore. The centre is small but quite lively – 60,000 students in a town of 100,000 inhabitants – so I guess you should expect a vibrant buzz. In the Middle Ages this was a great maritime republic rivalling Genoa and Venice. We stood on the bridge over the Arno River and took in the cream, yellow and rust coloured mansions, palazzos and churches lining the waterside. Approaching the Tower and the more touristy part of town, Son was much taken with a Jamaican/Rasta boar outside a cafe and decided this would be our eating establishment of choice (nothing about food, all to do with the boar). 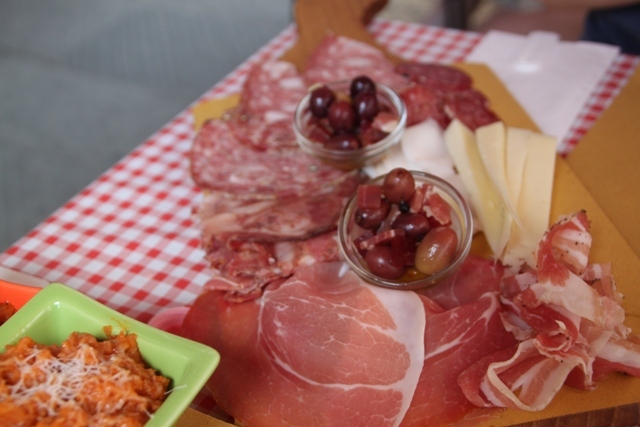 We sat in the sunshine and feasted on a Tuscan speciality platter – no idea exactly what, but it involved ham, bread, cheese, olives and much deliciousness and was just the thing to set us up for our later Tower climb. What an annoyance to have to re-plan a trip, but I’m glad you’re able to get the best out of it. Actually it turned out really well Cherrie – annoying to begin with, but we really enjoyed this holiday. Sometimes I think I can overplan a bit, when you’re forced to rethink like this it can work out even better. I love your photos. I was pleasantly surprised by Pisa as well. It was a beautiful, walkable city. Thank you! I would go back there again, we loved exploring all the nooks and crannies and gorgeous squares. Definitely a nice surprise. Pisa is on my list of places to visit- and I’m glad that there is more to do then just visit the tower! Great post. There is definitely more than the Tower – we loved exploring, the architecture and buildings are gorgeous and it’s a place for strolling and taking in the lovely atmosphere. I hope he lived to fight another day too!! 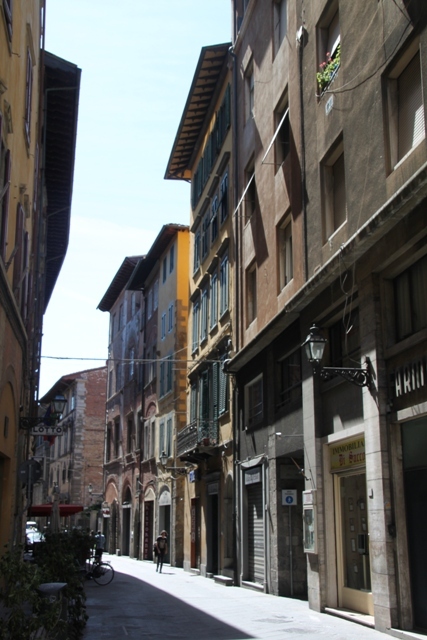 I think this particular one did….. We did visit the tower and enjoyed that, but exploring the back streets and finding there was so much more to Pisa was my favourite part of this trip. I’m glad the hassle turned out to be serendipitous. I’ve never been to Pisa and admit it looks much more appealing than I had been led to believe. We were very pleasantly surprised! Not only is it very beautiful there is a lot of interesting history and it sparked our son’s (current) interest in Galileo. Lovely photos, the architecture is so elegant with the bright colours. 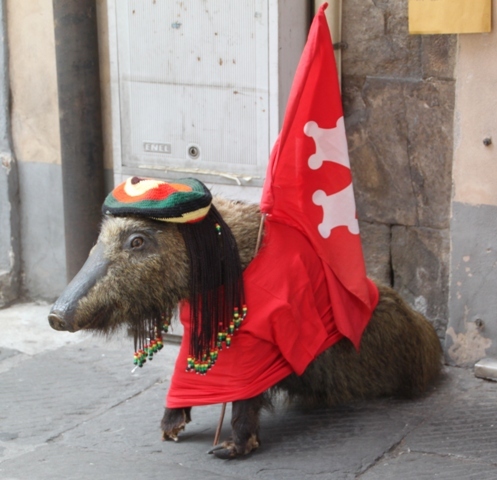 The boar made me laugh but he looks less than impressed with his attire! We loved that boar too!! Pisa surprised me, it really is a lovely city with beautiful buildings. great and amazing photos. Well detailed sharing valuable information. I enjoyed it! Thank you! It’s a beautiful place, hard to take a bad photo there. Thank you – we had fun exploring and taking it all in too! So true and for an “overplanner” like me quite a refreshing change to find things do go well without all that much preparation! Glad you enjoyed Pisa. Your pics as always are fab. Loved it Diana, but then I don’t think there is anywhere in Italy I’ve visited that I don’t like! There’s just something about the Alps isn’t there! Every time I fly over them and am lucky enough to get a good view through the clouds it just makes the heart beat a bit faster. Hi Joy. Interesting post. We just went to Italy last week of july. Milan > Bologna > Firenze (with a day in Siena). I’d managed to convince my wife that adding Pisa was too much. But we’ll include it on our next italian trip. Thanks Brian. 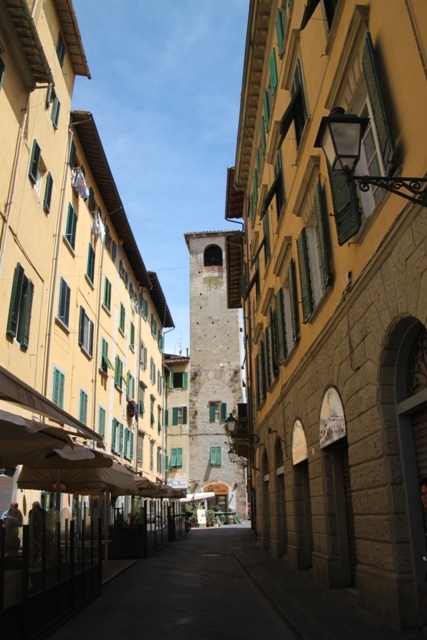 We enjoyed Pisa – so much more to see than just the Tower, although we did enjoy that too! We went to Florence and the Cinque Terre as part of this trip – would have liked to squeeze in Siena too but like you I thought that was probably too much! 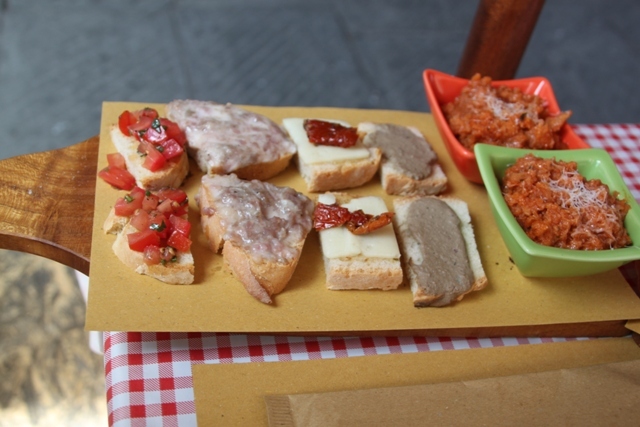 We’ll have to include that in our next Italy jaunt. Thanks Rosemary. Pisa is lovely – often overlooked by tourists and for that reason much less busy and far more relaxing than somewhere like Florence (although I love it there too!!). It is a great city and we loved our brief time there. Hope you enjoy your weekend too. Wow – what a beautiful city! I may have to convince the family to give Italy a try in a few years. You definitely should Heather – Italy is one of my favourite countries, I could rave about it for ever. We weren’t expecting Pisa to be so beautiful – more of a convenient overnight stop but were so pleasantly surprised. Really enjoying reading about your travels too – a lot more adventurous than ours!! So true – this was not what we had planned but it was one of the best trips we’ve taken. Hope you manage to get back to Italy – if you do you should definitely check out Pisa, it’s a lovely city. Thanks for reading! Definitely on my list of places to go next time im in Italy. Looks lovely! It is a great city – so much to see as well as the Leaning Tower!